Virtual reality is finding ever more use cases in the world of healthcare. For training purposes, to treat people with e.g. PTSS. Now Stanford Medicine is adding to thee cosystem, using a new software system that combines imaging from MRIs, CT scans and angiograms to create a three-dimensional model that physicians and patients can see and manipulate — just like a virtual reality game. Created by the Colorado startup Surgical Theater, the VR system is helping train residents, assist surgeons in planning upcoming operations and educate patients. It also helps surgeons in the operating room itself, guiding them in a three-dimensional space. An example on the patient side: having undergone two aneurysm surgeries, Sandi Rodoni thought she understood everything about the procedure. But when it came time for her third surgery, the Watsonville, California, resident was treated to a virtual reality trip inside her own brain. For the residents, class is held in a room in the hospital basement. Once the residents don headsets, an instructor — who shows up as an avatar in a white coat — can lead them inside the brain of a patient. 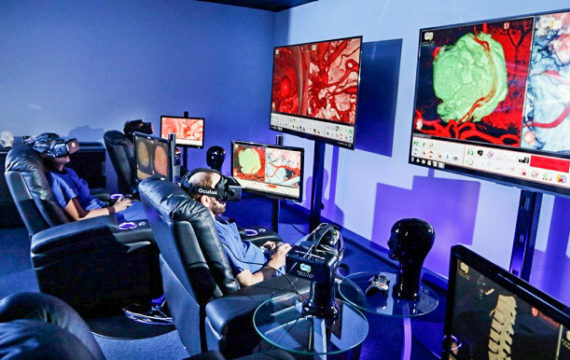 The system allows instructors to highlight different components of the brain, such as arteries to show an aneurysm, bones to show skull deformities or tissue to show a tumor, while rotating the view to illustrate how a tumor or aneurysm looks from different angles. They can also progress, as avatars, through the steps for removing a tumor or fixing an aneurysm, starting outside the skull. Surgeons make their way down to the Neurosurgical Simulation Lab to practice an upcoming operation. Because they’re practicing on images from the actual patient, rather than a generic brain, they can map out the surgery ahead of time. “It’s a window into the brain — and a window into the brain of the particular patient we’re going to operate on,” said Anand Veeravagu, MD, an assistant professor of neurosurgery and the head of the Stanford Neurosurgical Simulation Lab. Stanford Medicine doctors are using the VR technology for the brain and spinal cord because these organs are stable and lend themselves to imagery — unlike other body parts, which move with blood flow and breathing. Collins said the technology may soon be available for the rest of the body.